These are featured pictures related to the United Kingdom which appear on Portal:United Kingdom. Photo credit: Diliff Leadenhall Market is a covered market in the City of London, located in Gracechurch Street. The market dates back to the fourteenth century. The ornate roof structure, painted green, maroon and cream, and cobbled floors of the current building, designed in 1881 by Sir Horace Jones, make the building a tourist attraction. It was used to represent the area of London near the Leaky Cauldron and Diagon Alley in the film Harry Potter and the Philosopher's Stone. Photo credit: Andrew Dunn The Great Court of the British Museum was reopened in 2000 by Queen Elizabeth II after its redevelopment. The tesselated glass roof was designed by architects Foster and Partners and covers the entire court, making it the largest covered square in Europe. Photo credit: Chowells The Supermarine Spitfire was an iconic British single-seat fighter used by the RAF and many Allied countries in the Second World War. Photo credit: Diliff The Coca-Cola London Eye, sometimes called the Millennium Wheel, was the first observation wheel (a type of Ferris wheel) to be built, and has been the only one in operation since its opening at the end of 1999. It stands 135 metres (443 ft) high on the western end of Jubilee Gardens, on the South Bank of the River Thames in Lambeth, London, between Westminster Bridge and Hungerford Bridge. It is adjacent to London's County Hall, and stands opposite the offices of the Ministry of Defence. Photo credit: Chowells Another Place is a piece of modern sculpture by Antony Gormley, currently erected on Crosby Beach, Liverpool until the end of 2006. It consists of 100 cast iron figures which face out to sea, spread over a 2 mile stretch of the beach. Each figure is 189 cm tall (nearly 6 feet 2½ inches) and weighs around 650 kg (over 1400 lb). In common with most of Gormley's work, the figures are cast from moulds of his own body. Photo credit: Chowells Liverpool Metropolitan Cathedral of Christ the King (usually shortened to Liverpool Metropolitan Cathedral) is a Roman Catholic cathedral in Liverpool, England. Designed by Sir Frederick Gibberd and consecrated in 1967, it replaced the Pro-Cathedral of St. Nicholas, Copperas Hill. The cathedral stands on the site previously occupied by the Liverpool Workhouse, on Hope Street. Facing it at the opposite end of Hope Street is the Cathedral Church of Christ in Liverpool, the city's Anglican cathedral. Photo credit: David Iliff Crib Goch (Welsh for red ridge) is a "knife-edged" arête in Snowdonia National Park; all routes which tackle Crib Goch are considered mountaineering routes or scrambles. Crib Goch is the wettest place in the United Kingdom, with an average of 4,473 mm (176 in) rainfall a year over the past 30 years. Photo credit: Abubakr Hussain Loch Lomond is a Scottish loch located in both the western lowlands of Central Scotland and the southern Highlands. Its surface area is the largest of the lochs, and is second biggest after Loch Ness in terms of water volume in Great Britain. The loch famously features in Andrew Lang's verse, The Bonnie Banks o' Loch Lomond, published around 1876, the chorus of which is well known. Photo credit: Unknown U.S. soldier The Battle of Normandy was fought in 1944 between the German forces occupying Western Europe and the invading Allied forces as part of the larger conflict of World War II. 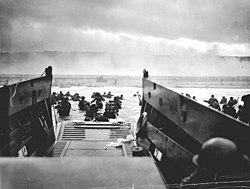 Sixty years later, the Normandy invasion, codenamed Operation OVERLORD, remains the largest seaborne invasion in history involving almost three million troops crossing the English Channel from England to Normandy in then German-occupied France. 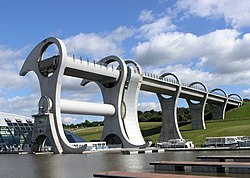 Photo credit: Sean Mack The Falkirk Wheel, named after the nearby town of Falkirk in central Scotland, is a rotating boat lift connecting the Forth and Clyde Canal with the Union Canal, which at this point differ by 24 metres, roughly equivalent to the height of an eight storey building. Photo credit: Dan Smith Bentley Motors Limited is a British based manufacturer of luxury automobiles and Grand Tourers. 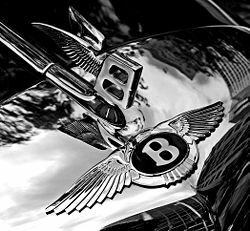 Bentley Motors was founded in England on January 18, 1919 by Walter Owen Bentley, known as W.O. Bentley or just "W.O." (1888–1971). He was previously known for his successful range of rotary aero-engines in World War I, the most famous being the Bentley BR1 as used in later versions of the Sopwith Camel. The company is currently owned by the Volkswagen Group. Photo credit: UK Government The 1917 Battle of Passchendaele, also known as the Third Battle of Ypres, was one of the major battles of World War I, fought by British, ANZAC, and Canadian soldiers against the German army. The battle was fought for control of the village of Passendale, (Belgium-French Passchendaele on maps of that time), near the Belgian town of Ypres in West Flanders. Photo credit: Saffron Blaze Bibury is a village in Gloucestershire, England. The Cotswold stone cottages of Arlington Row, pictured, were built in 1380 as a monastic wool store and converted into weaver cottages in the 17th century. William Morris, a leading light of the Arts and Crafts Movement, called Bibury "the most beautiful village in England". The Lindisfarne Gospels is an illuminated Latin manuscript of the gospels of Matthew, Mark, Luke and John. The manuscript was produced on Lindisfarne in Northumbria in the late 7th century or early 8th century, and is generally regarded as the finest example of the kingdom's unique style of religious art, a style that combined Anglo-Saxon and Celtic themes, what is now called Hiberno-Saxon art. Photo credit: Andrew Dunn Stonehenge is a Neolithic and Bronze Age monument located near Amesbury in the English county of Wiltshire. Constructed between 2500 BC and 2000 BC, it is composed of earthworks surrounding a circular setting of large standing stones, known as megaliths. Archaeoastronomers claim that Stonehenge represents an "ancient observatory," with significant alignments for the sunrise on the solstice and equinox days. Photo credit: Diliff A stitched image of the Radcliffe Camera in Oxford, as seen from the tower of the Church of St Mary the Virgin. The building, often abbreviated as 'Rad Cam', was built by James Gibbs in 1737–1749 to house the Radcliffe Science Library. After the Radcliffe Science Library moved into another building, the Radcliffe Camera became a reading room of the Bodleian Library. Image credit: Mintguy & Fredrik A diagram of movement within a roundabout in a country where traffic drives on the left. A roundabout is a type of road junction, or traffic calming device, at which traffic streams circularly around a central island after first yielding to the circulating traffic. Unlike with traffic circles, vehicles on a roundabout have priority over the entering vehicle, parking is not allowed and pedestrians are usually prohibited from the central island. Photo credit: Andrew Dunn Henry Moore's Reclining figure (1951) is characteristic of Moore's sculptures, with an abstract female figure intercut with voids. There are several bronze versions of this sculpture, but this one is made from painted plaster, and as of 2007[update] is sited outside the Fitzwilliam Museum in Cambridge (on loan from the Henry Moore Foundation). Robert Hooke's drawing of a flea in his Micrographia, a book of observations through various lenses published in 1644. The book demonstrated the tremendous power of the new microscope. On completing the book, Samuel Pepys described it as: "the most ingenious book that I ever read in my life." Photo credit: Diliff The Albert Memorial, a monument to Prince Albert found in Kensington Gardens, London, as seen from the south side. Directly to the north of the Royal Albert Hall. It was commissioned by Queen Victoria and designed by Sir George Gilbert Scott in the Gothic revival style. Opened in 1872, the memorial is 176 feet (54 m) tall, took over ten years to complete, and cost £120,000. Photo credit: David Wilson Clarke Angel of the North is a modern sculpture created by Antony Gormley, which is located in Gateshead, England. As the name suggests, it is a steel sculpture of an angel, standing 20 metres (66 feet) tall, with wings of 54 metres (178 feet) — making it wider than the Statue of Liberty's height. The wings themselves are not planar, but are angled 3.5 degrees forward, which Gormley said was to create "a sense of embrace". It stands on a hill overlooking the A1 road and the A167 road into Tyneside and the East Coast Main Line rail route. Thomas More was a lawyer and political figure in 16th century England, best remembered as Henry VIII's Lord Chancellor. St. Thomas More was an influential shaper of modern thought, introducing the term Utopia with his novel by the same name, and at the same time a devout Catholic, even embracing ascetical practices such as the use of a hair shirt. He became increasingly firm in his Catholic religious convictions and fell into disfavour with Henry VIII over his refusal to accept Henry as the head of the Church of England. This in turn lead to More's execution at the Tower of London in 1535. On the 400th anniversary of his execution, More was declared a Saint. Photo credit: Lt. J. W. Brooke A Cheshire Regiment sentry in a trench near La Boisselle during the Battle of the Somme. The battle is best remembered for its first day, 1 July 1916, on which the British Army suffered 57,470 casualties, including 19,240 dead. With more than one million casualties over five months, it was one of the bloodiest battles in human history. The Allied forces attempted to break through the German lines along a 25-mile (40 km) front north and south of the River Somme. Photo credit: Diliff The British Museum Reading Room, situated in the centre of the Great Court of the British Museum, used to be the main reading room of the British Library. In 1997 this function moved to the new British Library building at St Pancras, London, but the Reading Room remains in its original form. Designed by Sydney Smirke on a suggestion by the Library's Chief Librarian Anthony Panizzi, following an earlier competition idea by William Hosking, the Reading Room was in continual use from 1857 until its temporary closure in 1997. Photo credit: Diliff The quadrangle of Windsor Castle, one of the principal official residences of the British monarch. On the far left are the State Apartments, at the end of the quad are the Private Apartments, where Queen Elizabeth II resides on weekends, and on the right, the South Wing. Located at Windsor in the English county of Berkshire, it is the largest inhabited castle in the world and, dating back to the time of William the Conqueror, the oldest in continuous occupation. Photo credit: Diliff The Clock Tower is a turret clock structure at the north-eastern end of the Houses of Parliament building in Westminster, London. It is popularly known as Big Ben, but this name actually belongs to the clock's main bell. The tower has also been referred to as St. Stephen's Tower or The Tower of Big Ben, in reference to its bell. Photo credit: Diliff 30 St Mary Axe, otherwise known as "The Gherkin" or the Swiss Re building, at 180 m (590 ft) is the 6th tallest in London, England. Designed by Foster and Partners, the architectural design of the tower contrasts sharply against more traditional buildings in London. Its design won the prestigious RIBA Stirling Prize for the best new building by a RIBA architect in 2004 and the 2003 Emporis Skyscraper Award for the best skyscraper in the world completed that year. The building is visible from a long distance from Central London: from the north for instance, it can be seen on the M11 motorway some 32 km (20 mi) away. Photo credit: Diliff Tower Bridge is a bascule bridge in London over the River Thames. It is close to the Tower of London, which gives it its name. It has become an iconic symbol of London and is sometimes mistakenly called London Bridge, which is the next bridge upstream. The bridge is owned and maintained by City Bridge Trust, a charitable trust overseen by the City of London Corporation. 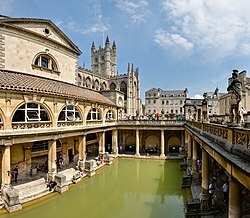 Photo credit: Diliff Bath is a city in South West England most famous for its baths fed by three hot springs. It is situated 99 miles (159 km) west of Central London and 13 miles (21 km) south east of Bristol. Photo credit: Jürgen Matern Panoramic view of the geodesic dome structures of the Eden Project. The Eden Project is a large-scale environmental complex near St Austell, Cornwall. The project was conceived by Tim Smit and has quickly become one of the most popular visitor attractions in the United Kingdom. The complex includes two giant, transparent domes made of ETFE cushions, each emulating a natural biome, that house plant species from around the world. The first emulates a tropical environment, the other a warm temperate, Mediterranean environment. The project took 2½ years to construct and opened to the public in March 2001. Photo credit: Diliff The Palace of Westminster, also known as the Houses of Parliament, is where the two Houses of the Parliament of the United Kingdom (the House of Lords and the House of Commons) conduct their sittings. The Palace lies on the north bank of the River Thames in the London borough of the City of Westminster. Photo credit: Newton2 Broadway Tower is a folly located near the village of Broadway, Worcestershire, at one of the highest points of the Cotswolds. Its base is 1,024 feet (312 metres) above sea level. On a clear day thirteen counties can be seen from the top of the tower. It was designed by James Wyatt to resemble a mock castle, and built for Lady Coventry in 1797. Photo credit: Diliff The Royal College of Music is a prestigious music school located in Kensington, London, founded in 1882. The college building was designed by Sir Arthur Blomfield. Photo by Chalmers Butterfield Shaftesbury Avenue from Piccadilly Circus in 1949. Shaftesbury Avenue is a major street in London, named after Anthony Ashley Cooper, 7th Earl of Shaftesbury, that runs in a north-easterly direction from Piccadilly Circus to New Oxford Street, crossing Charing Cross Road at Cambridge Circus. Photo credit: Diliff Panorama of London taken from the dome of St Paul's Cathedral. Built from 1675 to 1708, the Cathedral is still one of the highest buildings in western London. Credit: Thomas Lawrence George IV of the United Kingdom as the Prince Regent, circa 1814. He served as king of the United Kingdom of Great Britain and Ireland from 1820 to 1830. The Regency, George's nine-year tenure as Prince Regent, which commenced in 1811 and ended with George III's death in 1820, was marked by victory in the Napoleonic Wars in Europe. Photo credit: Phil Chambers David Suchet OBE (born May 2, 1946) is an English actor best known for his television portrayal of Agatha Christie's Hercule Poirot in the television series Agatha Christie's Poirot. Artist: Unknown Edward VI (12 October 1537 – 6 July 1553) became King of England, King of France (in practice only the town and surrounding district of Calais) and Edward I of Ireland on 28 January 1547, and was crowned on 20 February, at nine years of age. Edward, the son of Henry VIII and Jane Seymour, was the third monarch of the Tudor dynasty and England's first ruler who was Protestant at the time of his ascension to the throne. Edward's entire rule was mediated through a council of regency as he never reached maturity. Image credit: Entr'acte The Entr'acte expresses its pleasure that Gilbert and Sullivan are reunited. Mary of Teck (26 May 1867 – 24 March 1953) was the Queen Consort of George V. Queen Mary was known for setting the tone of the British Royal Family, as a model of regal formality and propriety, especially during state occasions. She was the first Queen Consort to attend the coronation of her successors. Noted for superbly bejewelling herself for formal events, Queen Mary left a collection of jewels now considered priceless. 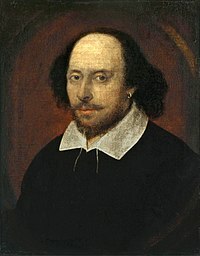 The Chandos portrait of William Shakespeare, attributed to John Taylor. National Portrait Gallery, London. Beer Street and Gin Lane are 1751 engravings by William Hogarth published partly to support the 1751 Gin Act. Beer Street shows a happy city drinking the 'good' beverage of English beer, whereas Gin Lane claims to show what would happen if people started drinking gin, a harder liquor. People are shown as healthy, happy and hard working in Beer Street, while in Gin Lane they are scrawny, lazy and acting carelessly, including a drunk mother accidentally sending her baby tumbling to its doom. Artist: Unknown The Felbrigge Psalter is the oldest book from England to have an embroidered bookbinding. The needlework on this mid-thirteenth century manuscript probably dates from the early fourteenth century, which puts it more than a century earlier than the next oldest embroidered binding to have survived. Both the design and execution depicting the annunciation are of exceptionally high quality. Artist: Steven van der Meulen The "Hampden" portrait of Elizabeth I of England, an early full-length portrait of the young queen in a red satin gown. Photo credit: David Iliff Dunrobin Castle is a stately home in Sutherland, in the Highland area of Scotland. It is the family seat of the Earl of Sutherland and the Clan Sutherland. It is located 1 mile (1.6 km) north of Golspie on the Dornoch Firth close to the A9 road. Dunrobin's origins lie in the Middle Ages, but most of the present building is the work of Sir Charles Barry, the architect of the Palace of Westminster in London, who greatly extended the building in 1845. Photo credit: David Iliff The City of London skyline, as viewed from the top floor viewing platform of City Hall on the southern side of the River Thames. Not to be confused with the London metropolitan area, the City covers 1.12 sq mi (2.90 km2) and, along with Westminster is the historic core of London around which the modern conurbation grew. "The City" and "the Square Mile" are metonyms for the United Kingdom's financial services industry, which are based in the area. The frontispiece to The Song of Los by the poet and painter William Blake, published in Lambeth in 1795. The poem is one of Blake's prophetic books, a group of epic poems drawing on his own personal mythology to comment on his times. The Song of Los is in two sections, the first describing the decline of European morality and the second urging for revolution. Photo credit: David Iliff Eilean Donan (Scottish Gaelic: Eilean Donnain) is a small island in Loch Duich in the western Highlands of Scotland. It lies about 1 kilometre (0.62 mi) from the village of Dornie, and is dominated by a picturesque castle which frequently appears in photographs, film and television. Eilean Donan is part of the Kintail National Scenic Area, one of 40 in Scotland. In 2001, the island had a recorded population of just one person. Photo credit: David Iliff, edited by Papa Limey Whiskey Beachy Head is a chalk headland in Southern England, close to the town of Eastbourne in the county of East Sussex, immediately east of the Seven Sisters. The cliff there is the highest chalk sea cliff in Britain, rising to 162 metres (531 ft) above sea level. Ophelia is a painting of 1851–2 by the Pre-Raphaelite artist Sir John Everett Millais in Tate Britain, London. 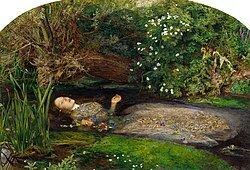 It depicts Ophelia, a character from Shakespeare's play Hamlet, singing before she drowns in a river. Photo credit: Colin The western departures concourse of London King's Cross railway station as seen through a fisheye lens. This semi-circular concourse, designed by John McAslan, built by Vinci and completed in March 2012, is designed to cater to much-increased passenger flows and provide greater integration between the intercity, suburban and Underground sections of the station. Photo credit: David Iliff The town of Keswick is nestled between the fells of Skiddaw and Derwent Water in the Lake District, Cumbria, England. It is shown here from about ¾ of the way to the summit of Walla Crag. The Caterpillar is a fictional character appearing in Lewis Carroll's book, Alice's Adventures in Wonderland, shown here in an illustration by John Tenniel. The illustration is noted for its ambiguous central figure, whose head can be viewed as being a human male's face with pointed nose and protruding chin or being the head end of an actual caterpillar, with two "true" legs visible. Photo credit: Peter Weis The red telephone box designed by Sir Giles Gilbert Scott is a familiar sight on the streets of the United Kingdom and is recognised throughout the world as one of the country's cultural icons. The example pictured here is a K6, the design seen most frequently outside London, and is situated near St Paul's Cathedral in the same city. This page was last edited on 6 September 2018, at 23:08 (UTC).